Sudoku puzzles are everywhere! And we're all fascinated! Daisy Sudoku is a simple (and free!) program that can be downloaded from the Internet and used to solve most of puzzles proliferating in newspapers all over the world. Shown is the Daisy Sudoku loaded with a puzzle from The Times. 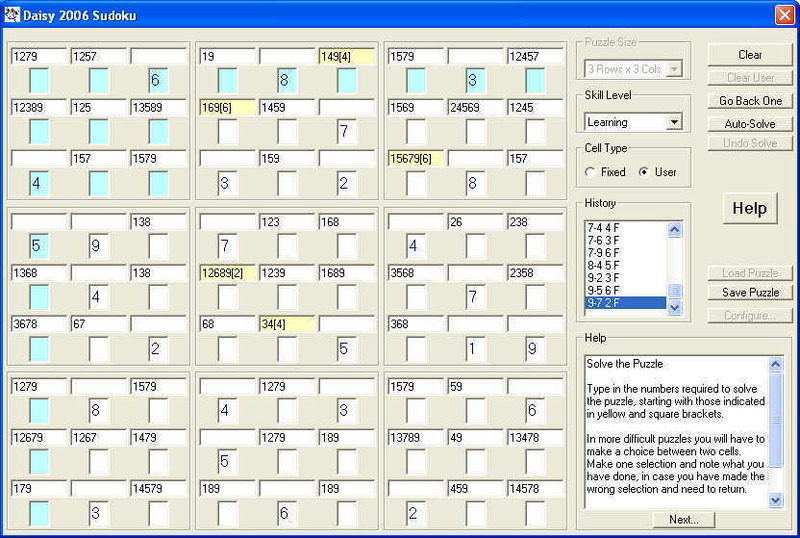 The yellow boxes indicate cells that can be solved using the number in brackets. An auto-solve is also provided to solve the puzzle automatically. See features for a full description of the program and notes for help in how to use the program to solve common puzzles. This program has been very much a personal creation, so that I spend less time pouring over puzzles in newspapers. It also shows the sort of programming that I love doing. I also like to think I'm good at it!